If you want to update the look and functionality of a bathroom in your McKinney, Texas, home, allow the experts at Star Home Remodeling to assist you. We can remodel your bathroom and create a beautiful and practical space you actually enjoy spending time in. For example, we can transform your bathroom into your very own spa, equipped with a luxurious soaking tub or modern walk-in shower. You can rely on us to bring the visions you have for your bathroom to fruition. We’ll begin your bathroom remodel by meeting with you at your home or our showroom where we can learn all about the vision you have for your updated space. During this time, we’ll supply you with information about the different products and services we offer. As a no-nonsense company, we will be upfront about all costs and construction timelines so that there aren’t any unpleasant surprises down the road. What’s more, we can custom-curate the perfect products for your style, needs, and budget. Plus, when you partner with Star Home Remodeling for your bathroom remodel, you can feel confident knowing that only highly skilled and experienced technicians will handle the renovation for you. Our team will ensure all aspects of the remodel are completed properly and that you’re totally satisfied with every step of the project. 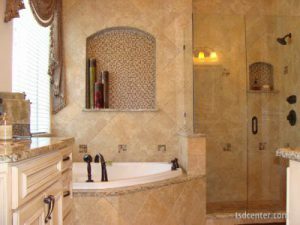 To learn more about the bathroom remodel services we offer to homeowners throughout the McKinney, TX, area, contact Star Home Remodeling today. We’ll be delighted to answer any questions you have.